Your search for the legendary Crown of Kings takes you to the Shamutanti Hills. Alive with evil creatures, lawless wanderers and bloodthirsty monsters, the land is riddled with tricks and traps waiting for the unwary traveler. Will you be able to cross the hills safely and proceed to the second part of the adventure - or will you perish in the attempt? Leaving the once-peaceful kingdom of Analand behind, you set off courageously into the wild, unruly and dangerous land of Kakhabad, armed with only your trusty sword and your knowledge of the magic arts. Your mission is to journey to the dark and distant Mampang Fortress, where the legendary Crown of Kings has been taken - stolen by the evil Archmage. Without the Crown of Kings, there is no hope for your homeland, for as chaos and anarchy descend, the Archmage will gather his bloodthirsty army and overrun all the neighboring kingdoms. Your all-or-nothing attempt to avert this disaster will take you from the Shamutanti Hills, through the dangerous streets of Kharé- Cityport of Traps, across the wilderness of the Baklands and finally to the evil Mampang Fortress itself, a journey covered in the four books of the Sorcery! series. You are about to embark on an epic adventure - a quest for the Crown of Kings. Your journey will take you from Analand, your home, across the unruly territories of Kakhabad to the Mampang Fortress wherein lies the treasured crown. In this solo fantasy role-playing game book you may elect to become either a wizard or a warrior. If you choose to be a warrior, a simple combat system will allow you to fight the various creatures of Kakhabad quickly and conveniently. If you choose wizardry as your skill, you will learn to master a unique magic system found in no other fantasy role-playing game. As would a real Grand Wizard, you will have to learn your spells! The spells available to you are found in the Spell Book, which is published separately, and you will prepare for your journey by memorizing these spells. you need not learn all the spells, for all forty-eight spells would be known only by a true Imperial Sorcerer. A basic knowledge of as few as six spells will be enough for you to start your journey. Whether wizard or warrior, the journey ahead will be dangerous and you will be faced with tricks, traps, problems and clues - not to mention the host of evil creatures which will try to prevent you reaching your goal. Through the multi-choice game book system, you will choose which paths to take, whether to fight or flee from combat and how you will solve problems. If death takes you, you will have to begin your adventure again. But if your skill is great and if luck - and your god - is with you, you may survive your overland journey to the Mampang Fortress. As a warrior relying on force of arms, or a wizard trained in magic, you must brave the terror of a city built to trap the unwary. You will need all your wits about you to survive the unimaginable horrors ahead and to make sense of the clues which may lead to your success - or to your doom! 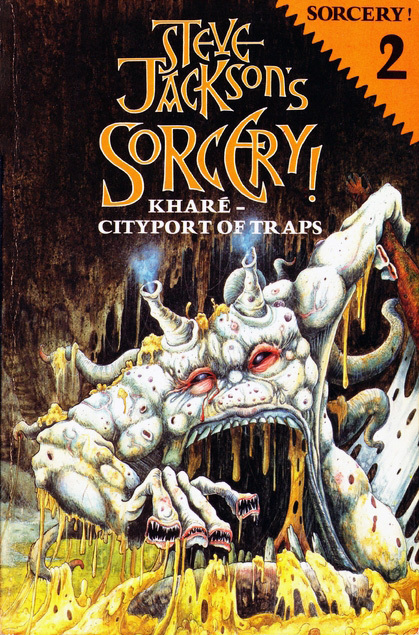 Kharé - Cityport of Traps is the second adventure in the Sorcery! series, following The Shamutanti Hills. But Sorcery! has been designed so that each adventure is playable in its own right, whether or not readers have been through the previous ones. If you are new to Sorcery! you may prefer to start your adventure from the very beginning. 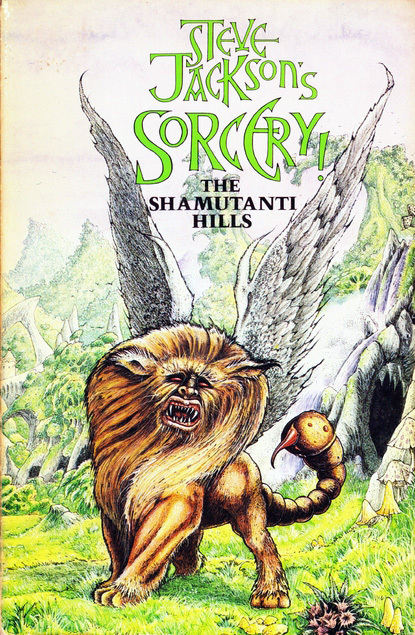 The first adventure, The Shamutanti Hills, is available with The Sorcery! 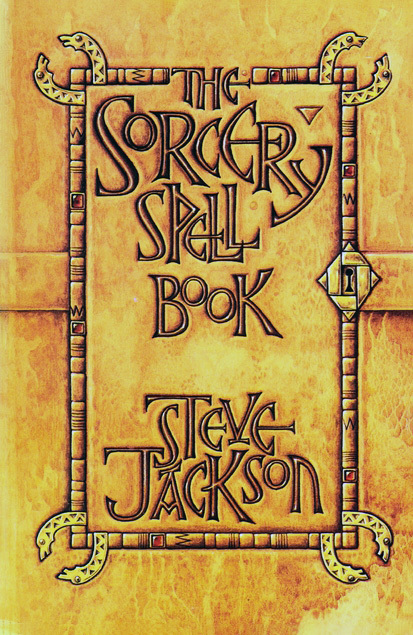 Spell Book as a two-book slipcase set, published by Penguin Books. Kharé is, however, a complete adventure within a city. New players will find all the information they need, together with an Adventure Sheet, at the beginning of this book. Readers who are now on the second stage of their journey will be able to skip over the rules section and plunge straight into the adventure: their characters, equipment and experience must be carried over from the previous adventure. Your quest to recover the legendary Crown of Kings from the evil Archmage who stole it has led you to the awful wilderness of the Kakhabad Baklands. Beyond lies your goal - the dark Mampang Fortress, where the Archmage sits plotting the downfall of the neighboring kingdoms. If only you can reach it in time! But your courageous mission is already in great danger! Seven deadly and magical serpents speed ahead of you to warn the Archmage of your coming. Will you be able to catch them before they reach him? 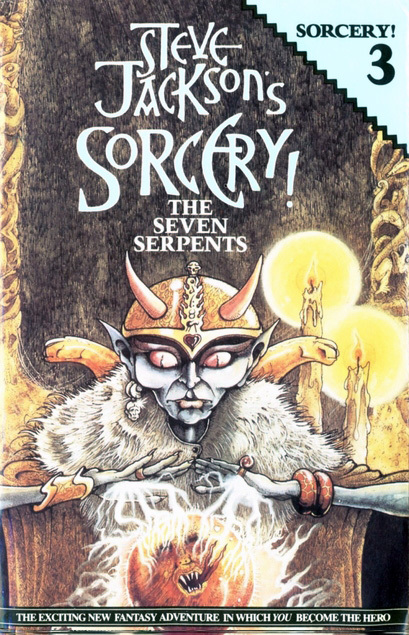 The Seven Serpents is the third adventure in the Sorcery! series, following The Shamutanti Hills and Kharé - Cityport of Traps. But Sorcery! has been designed so that each adventure is playable in its own right, whether or not readers have been through the previous ones. If you are new to Sorcery! you may prefer to start your adventure from the very beginning. The first adventure, The Shamutanti Hills, takes you from Analand, your homeland, out into the wilderness of Kakhabad, armed with a knowledge of magic to see you through your journey. The Seven Serpents is, however, a complete adventure in itself. Set in the Baklands, a no man's land between the Cityport and the Fortress at Mampang, you must seek out and destroy the Seven Serpents. For these Serpents are the Archmage of Mampang's own messengers and they carry news of your mission back to him. But above all, you must survive! New players will find all they need to undertake the journey as warriors. But if you would prefer the magic arts to the power of the sword, you will also need The Sorcery! Spell Book (reprinted at the end of this adventure) to learn your magic spells before you embark. Readers who are now on the third stage of their journey will be able to skip over the rules section and plunge straight into the adventure. Their characters, equipment and experience must be carried over from the previous adventure. The legendary Crown of Kings is at last within your grasp - or is it? The grim towers of Mampang Fortress stand before you, stark against the landscape. Evil oozes silently from its center, poisoning all it touches with it malevolence. Somewhere within these walls the dreaded Archmage is hidden and, with him, the legendary Crown of Kings you have risked so much for. You will need all your wits about you and your magical skills will be tested to the limit as you pit your life and your strength against the unknown horrors inside! 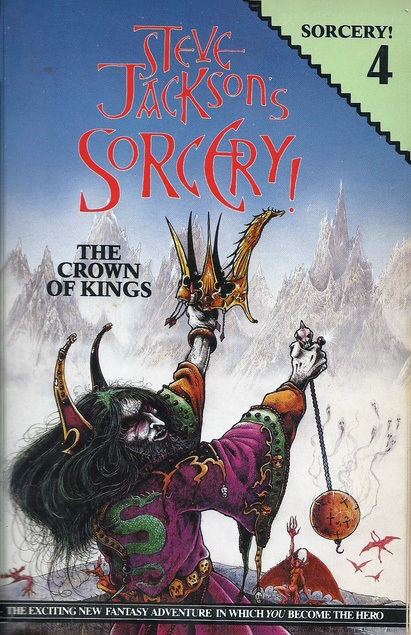 The Crown of Kings is the fourth adventure in the Sorcery! series, following The Shamutanti Hills, Kharé - Cityport of Traps and The Seven Serpents. But Sorcery! has been designed so that each adventure is playable in its own right, whether or not readers have been through the previous ones. The Crown of Kings is, however, a complete adventure in itself. Set in the Fortress at Mampang, you must recover the Crown of Kings, which is guarded by the Archmage himself. But before you confront the evil Archmage, you must find your way into Mampang and then through the traps and terrors of the Fortress itself. New players will find all they need to undertake the journey as warriors. But if you would prefer the magic arts to the power of the sword, you will also need The Sorcery! Spell Book (reprinted at the end of this adventure) to learn your magic spells before you embark. Readers who are now on the final stage of their journey will be able to skip over the rules section and plunge straight into the adventure. Their characters, equipment and experience must be carried over from the previous adventure. If you have chosen to adopt the role of wizard in Sorcery! The Sorcery! Spell Book is a must. For it contains the forty-eight spells you will need to enable you to challenge your foes and defeat your enemies using the magical arts of sorcery. Your mission will be fraught with danger but with these spells at your command you may yet succeed in your task - and live to tell the tale! Many dangers lie ahead and your success is by no means certain. You may choose to face your foes using the magical art of sorcery or wielding the power of the sword but whether it is a wizard or a warrior you will need all your wits about you. Begin your quest for the Crown of Kings with The Shamutanti Hills and Kharé - Cityport of Traps. As you familiarize yourself with the spells in this Spell Book, your skill and abilities in the SORCERY! adventures will improve. Learning the six basic spells will allow you to start playing with minimal delay. These spells will get you out of most difficulties, but they are expensive (in terms of STAMINA points) and you will often find it necessary to rely on your limited powers of swordsmanship, particularly with weaker creatures, in order to avoid running dangerously short of STAMINA. Other spells are more economical but will be given less often as options, thus relying more on your memory and skill as a wizard. The most economical spells of all are those which require magical artifacts, which must be found on your adventure. Remember that there are heavy penalties for guessing spells! If you choose a spell code which does not represent a spell, or if you choose a spell for which you do not have the required artifact, you will lose extra STAMINA points. In some cases, death will be your penalty! Finally, remember that not all spells will be used in the first adventure. Some will not come in until the second, third or fourth adventures. A few are never used at all! As you get into these later books, your six basic spells will be given less often as options. The spells are arranged to some extent in their order of usefulness in the Spell Book listing- but this is not a hard and fast rule. An adept wizard should be able to complete the first adventure without too much difficulty but the going gets progressively rougher in further installments. You will soon begin to make your own discoveries about the spells themselves. There is a certain logic to the way they are arranged, the options that are given and their codes. But these discoveries you must make for yourself. Experience will make you more skillful with magic. All this is part of the art of sorcery. For more on Sorcery! and other Fighting Fantasy books, see Fighting Fantasy Gamebooks Online and Fang's Finest Emporium. A modified version of these books has been released as a mobile app.